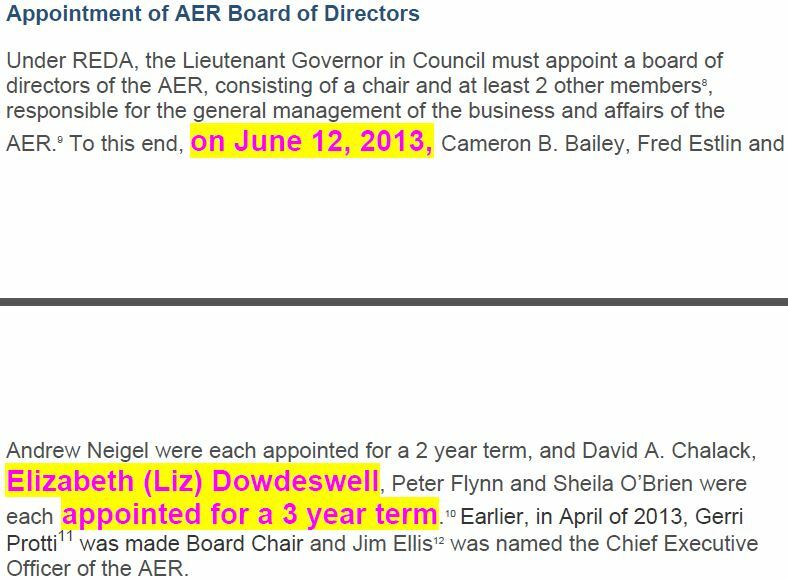 Note Council of Canadians is not the same as Council of Canadian Academies. HANTS COUNTY, N.S. – John Lohr, who is currently in the running for leadership of the Nova Scotia PC party, says he thinks the shale industry should be explored following the results of the Onshore Atlas Project, which shows a large reserve of natural gases in some parts of the province. The Onshore Atlas Project, which was conducted by the Department of Energy, highlights a large royalty potential from natural gas sources, and has re-opened the debate on fracking in the province. Lohr said he doesn’t have a strategy yet on how to determine what he would see as appropriate levels of community buy-in. 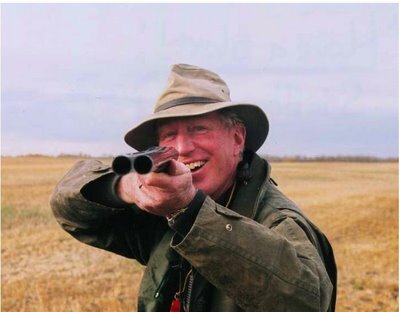 The MLA for Kings-North said he acknowledges that the environmental concern is the main point of opposition towards the practise. “We would have to have a fairly high level of confidence that we could address the issues of wastewater, if there is in fact any wastewater,” Lohr said, adding that some more modern hydraulic fracturing techniques don’t require as much wastewater. “The fact is that this report shows a potential of $20 to $60 billion U.S. natural gas resource available, which would mean $3 to $5 billion in royalties for Nova Scotia plus the income tax generated by the workers,” he said. Lohr said the province is already receiving benefits through federal equalization payments, which he says comes from ‘have provinces’ that use fracking including Alberta, Saskatchewan and British Columbia. In the 2017-18 year, Nova Scotia is expected to receive $1.779 billion in equalization payments from the federal government. He also said that Nova Scotia drills oil out at sea, which he says is potentially more dangerous as it’s harder to address issues on the water. Some studies have [PROVEN] suggested that fracking has also increased the risk of earthquakes in some jurisdictions, including in British Columbia. When asked whether or not the province should move on from fossil fuels entirely, as the Ecology Action Centre is calling for, Lohr said natural gas would be a benefit to Nova Scotia’s power generation if the existing coal fire plants were retrofitted to use natural gas. “If we did that, immediately we would have a 50 per cent reduction is greenhouse gas emissions,” he said. The sitting Liberal provincial government has yet to respond to questions from the Valley Journal-Advertiser regarding the Onshore Atlas Project. However, in previous statements to the media, Premier Stephen McNeil said the province remains committed to the fracking moratorium. Meanwhile, the provincial NDP is calling on the government to reaffirm Nova Scotia’s fracking ban. On the same day that Nova Scotia’s governing Liberals introduced legislation to ban high volume hydraulic fracturing in the province, I happened to be on a “fracking tour” in the U.S. with a bus load of other environmental journalists in a place that had instead embraced it. We were headed from New Orleans to the Louisiana/Mississippi border and the Tuscaloosa Marine Shale, an oil and gas-rich formation located in a 90-million-year-old layer of sedimentary rock sitting more than 11,000 feet below the surface. Encana Corporation had rights to the area and we were going to meet a representative to show us around one of its drilling pads. It didn’t take long for the news of Nova Scotia’s decision to make its way to the bus load of scrappy, mostly American reporters and researchers, many of whom regularly work the energy beat. As everyone cheered and clapped it struck me that when it came to fracking, it was highly unusual for a government to act in the public interest. And indeed this government had. The legislation came on the heels of an independent panel review on the subject, headed by David Wheeler, which received nearly 240 submissions, with 92 per cent in support of a moratorium on the controversial technology. 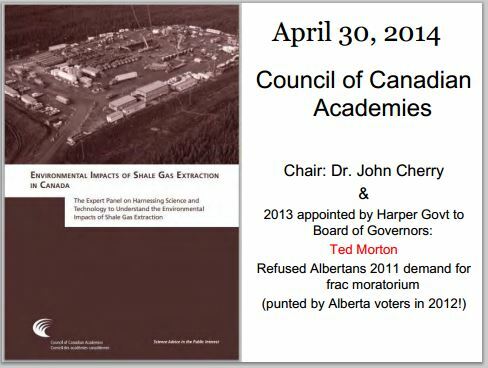 There’s mountains of baseline information, synergized Dr John Cherry and his merry band of industry controlled “experts,” chose to ignore it, likely as ordered by pro-fracking ex PM Steve Harper, pro fracking ex Alberta MLA Ted Morton, CAPP, AER, etc. 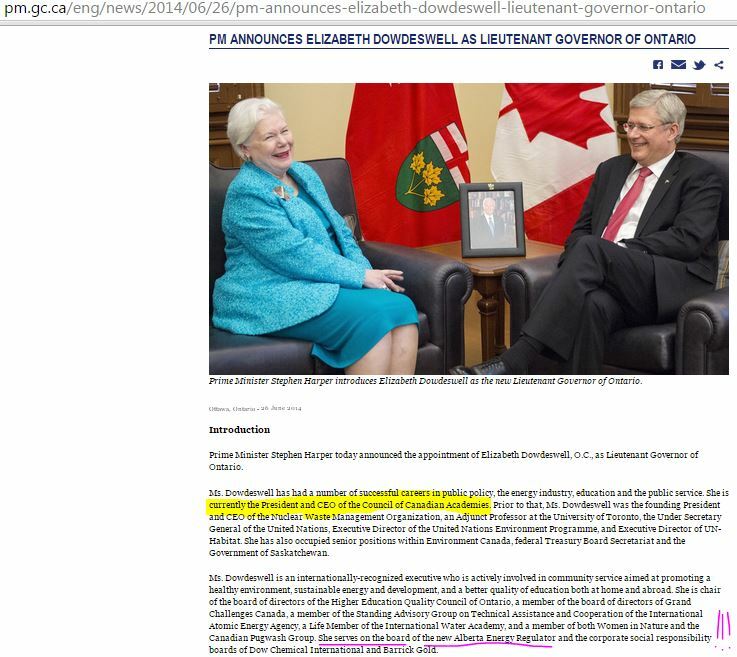 The panel was directly sent a copy of Ernst’s Brief review of threats to Canada’s groundwater from the oil and gas industry’s methane migration and hydraulic fracturing in June 2013. 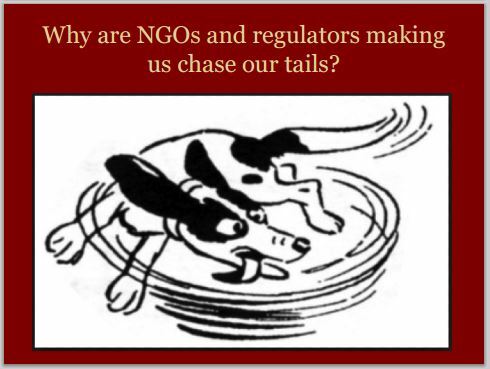 The “experts” not only ignored it and the endless damning industry and regulator data and reports summarized and referenced in it, they instead mainly reviewed and referenced Alberta Energy Regulator (AER) and Canada’s big oil and gas lobby group (CAPP) propaganda. 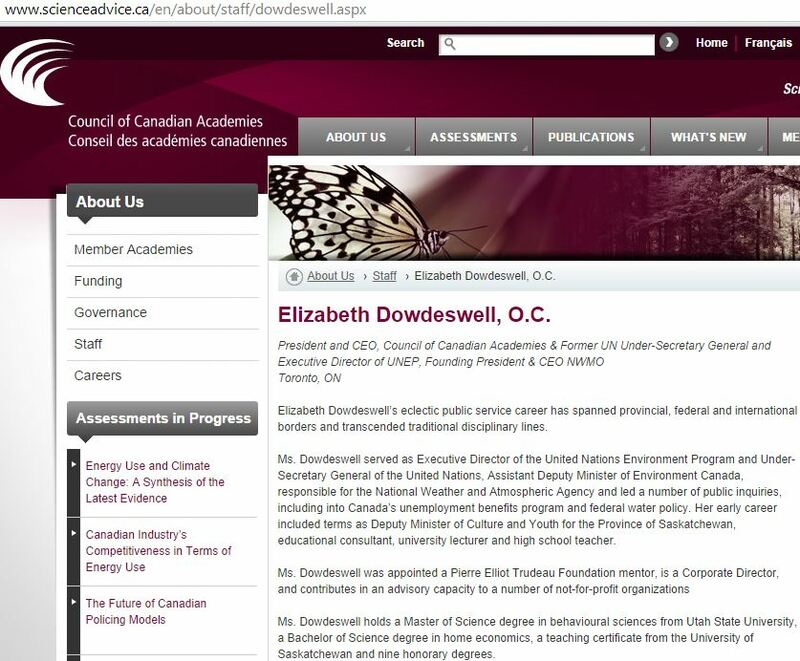 At the time of the glaringly deficient “review,” that urged the use of Canadians as guinea pigs in it’s go slow approach recommendation, and that lied and overlooked the most important and damning scientific evidence proving significant risks and damages from frac’ing, the president of the Council of Canadian Academies, Elizabeth Dowdeswell, O.C., was on the board of the Alberta Energy Regulator (AER) – nasty sneaky conflict of interest. Geoff MacLellan, the energy minister, to his credit, responded with assurances that that the government had no intention of lifting the moratorium. Let’s hope this is true because one doesn’t have to look very far to see the chaos and damage fracking has caused elsewhere. The key issue raised by Ernst’s case is that while it is known that fracking has caused thousands of earthquakes in the Western Canadian Sedimentary Basin, there is no formal protocol for investigating groundwater contamination complaints, which are on the rise, and there is little or no monitoring of how the earthquakes might be impacting groundwater and gas migration. In his 2011 book, The End of Country: Dispatches from the Frack Zone, Seamus McGraw makes it pretty clear how fracturing rock thousands of feet below the earth’s surface could lead to the chaotic, highly unpredictable, and undesirable intermingling of fluids. McGraw compares the process to sending down “a kind of subterranean pipe bomb, a small package of ball-bearing-like shrapnel and light explosives.” As far as comparisons go, it seems to be a good one. Millions of gallons of water along with sand and a host of chemicals (referred to as slick water) are pumped at such a force into the shale formations that the rocks shatter and release untapped deposits of oil and gas.4 The sand functions as a wedge to hold open the fractures to allow the release of the trapped gas or oil. On our way to the Encana drilling site I learned that the fracking boom in the State of Louisiana resulted in a long list of high profile incidents called “fraccidents,” including pipeline ruptures, explosions, well blow-outs, and yes, the discoveries of contaminated, flammable drinking water. On the bus, folks from the Gulf Restoration Network spoke about the exorbitant water consumption of the practice, the drilling of wetlands, and how both enforcement and compliance with rules was low. You’d think Louisiana would have been more circumspect. After all, it’s no stranger to oil to and gas catastrophes. In 2005, it suffered through Hurricane Katrina, the severity of which has been attributed to climate change, and then five years later, an oil slick appeared in NASA’s satellite images, 66 km off Louisiana’s coastline, swirling much like the hurricane did, in exactly the same place. It would become the largest marine oil spill in the history of the petroleum industry. All told, the explosion and sinking of British Petroleum’s oil platform Deepwater Horizon killed 11 rig workers and resulted in what felt like a never-ending horror: the gushing of oil from the seafloor for months — 87 days to be exact —amounting to a spill of nearly five million barrels of crude as well as the addition of nine million litres of toxic oil dispersants. Back in Louisiana, we never did meet the representative from Encana or actually see any fracking that day. We were told that at the last minute the company backed out. So instead we ended up pulling over on steamy country road and taking a short walk through a cemetery to a wooded area with a pump jack and a flare stack — drillers often burn off natural gas as a waste product when they’re after the more lucrative oil. It wasn’t what we came for, but it was at least something. We were then chased off that site because it was private land. For many of us on the bus, the news coming out of Nova Scotia on that day in September, four years ago felt like a bright, shining moment of sanity and democracy in action. Linda Pannozzo is the author of the 2016 book About Canada: The Environment. In 2014 she was in Louisiana attending the Society of Environmental Journalists’ annual conference where she received an award for her 2013 book The Devil and the Deep Blue Sea: An Investigation into the Scapegoating of Canada’s Grey Seal. She lives in Nova Scotia. I hope NS doesn’t yield to the temptation of a quick buck. The place to invest is the production, storage and transmission of renewable energy.